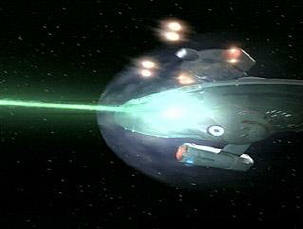 The USS Prometheus under attack and protected by its force field. "Force fields" are a novel idea, but impractical for ultra high-speed travel. The energy needed to protect a spaceship against the impact of a pebble (the size of a pea) would require more energy than what the whole U.S. would consume in over a thousand years. Shows like Star Wars and Star Trek have given people the impression that "force fields" could protect spaceship from high-speed impacts. Even if force fields were available, they still could not protect ultra high-speed spaceships. They would require far more power than what a spaceship could provide. As we saw earlier in this chapter, the impact from a pebble the size of a pea would produce energy equal to seven atomic bombs. The force field protecting the spaceship would obviously need to be more powerful than that. Although that is a great deal of energy, it is only a small portion of the energy needed. This energy (the energy equal to 7 atomic bombs) is the amount of energy needed to protect a single spot (an area the size of a pea). If the whole front of the spaceship were to be protected, we would need to greatly increase the power of the force field. The front surface area of the space shuttle is about a million times larger than the area we have been talking about (approximately one million centimeters). Therefore, to protect the entire front side of the spaceship for one second, the power going to the force field needs to be a million times greater. That would equal the total amount of energy consumed by the U.S. for 34 years. Even though this is a great deal of energy, this is still only a very small portion of the energy needed. The energy listed above is the energy consumed in one second. The spaceship will need around-the-clock protection, which means the force field needs to be operating all of the time. To protect the spaceship for the entire five years, you would need to increase the power by 158 million. 5.1 This would equal the energy released by a million billion atomic bombs. This is as much energy as the U.S. would consume in 5.4 billion years. To help make things a little more complicated, I have one more calculation to add. Previously, I talked about the energy needed to protect the spaceship for a period of one second. Actually, it would be much less than one second. Here on earth, the speeds of most collisions are usually rather slow so the duration-of-impact usually lasts about a full second. However, since the spaceship (in the above scenario) is traveling almost one billion feet per second, the duration-of-impact would be around 1/200,000,000th of a second. Therefore, the required energy to protect the spaceship would actually be 200 million times greater than what we already calculated. Although we obviously do not know how futuristic force fields would work, we still have to wonder how they would affect the forward movement of a spaceship. You would think the spaceship would slow down or go backwards if that much energy is projected toward its front. If this were true, we would have to increase the propulsion of the spaceship by that amount. So far we have only been talking about protecting the spaceship against objects the size of a pea. The force field will not fully protect the spaceship against larger objects. Larger objects will be slowed down a little, but they will still strike the spaceship with great force. If you increase an object’s size by 10, you increase its weight (mass) by 1,000. This means a rock the size of a softball would have an impact 1,000 times greater than the pebble we have been talking about. This means the rock will go through the force field almost as if nothing was stopping it. Some people will say outer space is a vacuum, completely void of anything but stars and planets. They will say that since there is virtually no chance of running into something in outer space, the issue of impact damage is a mute point. Unfortunately, this is not true. The following chapter will show that outer space is anything, but empty.